White Tigers in the Singapore Zoological Gardens. A map showing where tigers live. The tiger (Panthera tigris) is a carnivorous mammal. It is the largest member of the cat family, the Felidae. It lives in Asia, mainly India, China and Siberia. Bengal tigers live in the jungle called 'Sundarban' that is in Bangladesh and West Bengal of India. They are also found in other south-east Asian countries. They have orange fur with black stripes, and a white belly. The black stripes usually extend to the white underside. The stripes are used to keep them camouflaged while hunting. No two tigers have the same pattern of stripes. 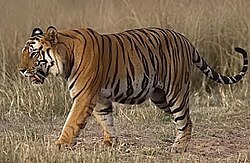 The tiger has 6 living subspecies, and 3 recently extinct (†) subspecies. Tigers are becoming very rare, because people hunt them for their skin and destroy the habitats they live in. The Bengal tiger has the largest population with 3,500 left in the wild. The South-Chinese tiger has the smallest population with only 20 or 30 left in the wild and about 60 in captivity. Tigers eat lots of different types of prey, mostly other large mammals. Some examples are deer, monkeys, wild pigs, tapirs and other animals found in Asia. All tigers are carnivores (meat eaters). Some tigers may eat up to 50 pounds (23 kilograms) of meat a day. Tigers kill their prey by clamping down on the prey's throat and suffocating it. ↑ "Information about tigers". British Broadcasting Corporation. http://www.bbc.co.uk/nature/life/Tiger. Retrieved May 27, 2012. ↑ "savechinastigers". http://english.savechinastigers.org/node/31. Retrieved 16 June 2010. This page was last changed on 16 December 2014, at 20:15.